Why do we need a video converter? Nowadays, multimedia is all around our daily life, we can’t imagine what world it would be without multimedia. Music, radios, movies, TV shows, DVD, etc. are all different forms of multimedia. And video is the most direct element of them for people to get visual enjoyment, share their happiness and sadness as well as record daily life. That’s why YouTube is so popular now. According to a research, most people will watch movies in their spare time with family or alone. In the meanwhile, our lives are now in the fast lane and time segments are generated in the way for work, going home or travels. Watching videos and reading books with a mobile phone or tablet are the most two adopted ways for people to dispose of such time segments. Along with technological advancements, now almost every people have one or more mobile phones, tablets or game consoles, most of which are capable of video playback. However, there are so many video formats and only several video formats can be played on the devices. Compatibility problem may ruin your movie night or spare time. That’s why so many people search the keyword “video converter” in Google search box. Why do we choose Any Video Converter? The smart developers of Anvsoft, Inc. released the first version of Any Video Converter in 2004. And at the very beginning of its release, it was widely acknowledged as a reliable, universal yet easy-to-use tool which can meet different requirements for video conversion. During the past decade, Any Video Converter team have been improving the software, following the latest technologies and trends as well as users’ feedback. When other video converters come and go like passing clouds, Any Video Converter is still one of the most popular video converters in the world. As you can see Any Video Converter has been ranking in first or second place in Google search results in the past decade. Unlike many competitors, Any Video Converter provides a full-featured yet totally free version. The fact of that, the free version is much more powerful than many so-called professional video converters, has been approved by millions of users and professional editors from CNET, PCWORLD, Lifehacker and more. And the professional and ultimate version of Any Video Converter cost less money than other competitors. What’s more, it’s only a one-time purchase to buy the professional or ultimate version, there is no upgrade fees, no subscription fees or any other cost. Boost video conversion speed up to 6X faster with CUDA and Open CL acceleration. What makes Any Video Converter outstanding and different from the rest?
" Use this video converter software to convert video files into the formats you need to watch on TV, load to a cell phone, put on a website, watch on your portable device and much more. In fact, the possibilities are endless using this powerful video file converter." " Very impressive! No bugs, easy to use. Captures videos off of internet and saves them in the format I choose. Converts file formats. Very use friendly. Doesn't bog my system down when working on my computer. No glitches so far and no nagging pop-ups. THE MOST IMPORTANT: IT'S FREE!!!" " Needed to convert a lot of mp4 videos to wmv for editing in wmm. This does it very well - transcodes to .avi using wmv codec and keeps the fps as original. Great piece of sw - I would have bought the full edition if the basic didn't already do what i needed....."
" I could not believe that something this great was freeware! In the past I saved my favs on You Tube, etc, only to find that when the artists put them on DVDs they removed the free versions. With the Converter u can grab them before they are gone!" " Worth the money, WAIT, IT'S FREE!!! Highly recommended for those who want to capture video and / or convert video to another format." " I use it since 2008 this is a reliable converter. Quick, converts all formats and very easy to use. Who says it's a 3min. convert ion (theonug) your an idiot men. It converts from the beginning to the end." " I use this program to convert MovieMaker video's to DVD player friendly format. Easy converting and burning does this program. Apart from converting my MovieMaker files it als converts my JVC video files to a useful other file extension." "AVC(Any Video Converter Freeware)’s HTML5 embedded video output capability is notable, as this feature will rapidly become a necessity for many. There are few special features available. AVC has a nice Clipping Video tool. It allows creating numerous trimmed segments, and then automatically adding them to the list of files to be converted. It can also take Snapshots of video being played back in the preview window. Curiously, this doesn’t operate if the video is paused, so you’ve got to grab them on the fly. AVC creates a unique folder for snapshots." "Although AVC is a dedicated converter and RealPlayer is first a media player, both did their job converting video file formats. On shear speed, AVC is the quicker of the two." "The products use a different interface design, but each is effective and simple to run in its own way. I do like the integration of RealPlayer’s Library and Converter, and the graphical approach of being able to see thumbnails, along with drag & drop. AVC has a more conventional, menu driven approach." -- Reviewed by PCworld Editor & Realnetworks, Inc.
" To have your favorite clips how you want them, whether that's on your DVR, iPod, PSP or desktop, you need the right utility to convert them into the format that works for you. Commercial video converter software's aplenty, but there are several solid free utilities that can convert your video files on every operating system, or if you've just got a web browser and a quick clip. Put DVDs on your iPod, YouTube videos on DVD, or convert any video file with Any Video Converter Freeware, today's top 10 free video converters and encoders." 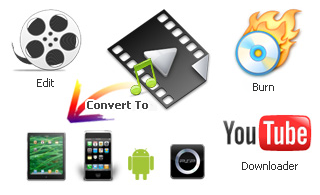 " Any Video Converter (Freeware/Windows only) Convert almost all video formats including DivX, XviD, MOV, rm, rmvb, MPEG, VOB, DVD, WMV, AVI to MPEG-4 movie format for iPod/PSP or other portable video device, MP4 player or smart phone with Any Video Converter, which also supports user-defined video file formats as the output. Batch process multiple files that AVC saves to a pre-selected directory folder, leaving the original files untouched." "I love Any Video Converter. There are a lot of video converter software solutions and I have tried many of them, but there is none better than Any Video Converter. It has been a life saver so many times I have lost count. Any Video Converter has saved me so much time and time is money. I tell everyone I know to get Any Video Converter when they need video conversion." "Finally we get one free video converter. Free Video Converter is the popular freeware utility which has millions of satisfied users who enjoy power, speed, and simplicity of this versatile instrument - a rare combination in the world of modern video compression technologies. This Free Video Converter converts almost any video formats to any formats, while preserving the straightforward interface design which makes this program so easy and fun to use." " I hate to use the cliche, but this is the video converter Swiss army knife. I am truly amazed at how often I find myself opening up this program. Any video converter has been able to convert everything I have thrown at it. Here are the conversions that it supports. Ten different types of media! Very impressive." "Thank you folks! - for providing your software free and simple to use. I am a senior citizen on SS, with some medical difficulties, and rather new in computers. I’ve been trying for a long time to down load music videos & convert them to TV compatible playback DVD's. Other software trials too complicated or just didn’t work. I was thrilled when my first attempt with yours worked the very first time. Logical and efficient steps! " " You Guys are Awesome	! ! ! Your product saved a project that was getting crazy and confusing - The simplicity of operation is just that -- simply unbelievable ! ! ! Please know that I will buy Your product and tell everyone I know to buy it ! ! ! !" "I have been using All Video Converter for about 6 months now. After searching, comparing, using others for a few months I finally ran into your freeware. It is the easiest and best freeware out there for your video converting needs. No bugs, No hassles, No BS. Just good freeware. I promote bands in Austin and do a lot on youtube for them. It has made my life much easier for me and my tasks at hands. I would just like to show my appreciation with this little note to you. " " Hello! I absolutely love your product! After trying a handful of video converters, I've found yours to not only do the best job, but is also incredibly user-friendly and very verstatile as to the range of input and output formats. "